To prepare the salad, slice cucumbers and transfer to a bowl. Stir in some salt and edible seaweed. Add rice vinegar, honey, some soy sauce, and one third of the sesame seeds to prepared cucumbers and seaweed and mix. Let sit for approx. 20 min. Meanwhile, peel and grate ginger and slice scallions for the tataki sauce. Mix together with lemon juice, mirin, toasted sesame oil, remaining soy sauce, and remaining sesame seeds. Set aside. Brush tuna steak with sunflower oil and season with salt. Transfer to a microwave-safe baking dish and grill tuna in an oven with microwave function for 5 min. at 220°C/428°F, 180W, then turn and grill for 3 min. more. Cut tuna in slices of about 0.5-cm/0.20-in. thick. 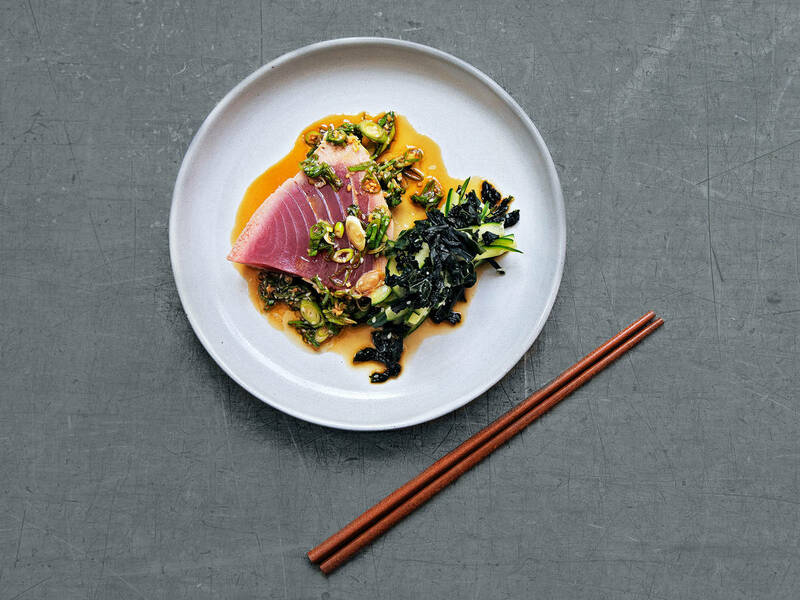 Serve with the tataki sauce and cucumber-seaweed salad on the side. Enjoy!